I’m far enough into this adventure to feel qualified in handing out the odd bit of advice to other aspiring freelancers and consultants. In this recurring column, I’ll drop some quick hits of knowledge and experience. Hope folks find it helpful. People will contact you. You will respond. You will not hear back from them. It’s cool. In the three days after changing my LinkedIn status to shout my new freelance availability from the rooftops, I received multiple messages and emails from old colleagues telling me they wanted to get me working on things for them. I responded enthusiastically, letting them know I’d be excited to work with them again, and that I was available to touch base or meet up with them whenever was convenient. It took a good long while for most of them to get around to responding. Even longer to actually pull me into projects, if they ever did. The point is this: people may not follow up right away. They also might forget altogether. And that’s both normal and okay. It took me a while to adjust to this, doubly so when it involved people with whom I had pre-existing relationships. Your instinct is to get bitter at anyone who gets your hopes up and then pulls a disappearing act. The reality though, is that people are busy, especially the type of people who find themselves in the market for freelance help, and especially the type of people who have the authority to sign off on hiring you to begin with. If you’re new to the game, and likely even if you’re not, you're probably dealing with a few less emails, expectations, and other such junk in your day-to-day business dealings than your old cube-mate who now has “Associate Creative Director” in front of his name. Cut them a ton of slack. You’re freelance now, and burning bridges is an absolute, end-of-the-line, this-is-not-worth-it-at-all last resort. Delete that vaguely passive-aggressive email in your drafts folder, cool down, and go back to combing LinkedIn for old friends with new jobs. You’re a self-employed adult now; keep busy. There are going to be days, and sometimes weeks I’m afraid, where you don’t have billable work, and every “tips for freelancers” list is going to tell you this: don’t just sit around doing nothing. Update your LinkedIn profile or online portfolio, maybe fire off emails to old colleagues. Invent some spec work to stay sharp. Take breaks by getting lunch with a colleague, going for a jog, or taking care of all that minor home upkeep you’ve been putting off. It’s as much about being productive to the benefit of your business as it is to just not getting into a rut of binge-watching Netflix shows and getting trapped in 3-hour Wikipedia holes. This sounds easy, but it can be a struggle for certain personality types. As a for instance, I have not even come close to mastering the above advice. I can murder client work with vigor, but the business-building stuff, for my own benefit, that I should constantly be jazzed about? When that’s all that’s on the agenda, it’s much easier to justify giving yourself a post-project breather .. that suddenly stretches into a week. 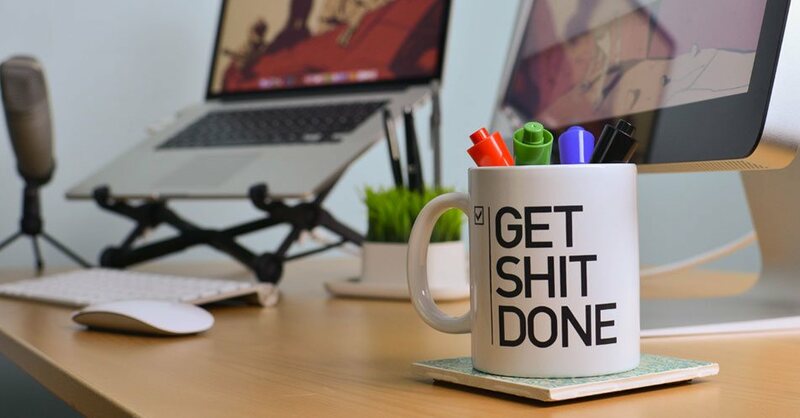 Stay self-aware enough to continually recognize when a lack of productivity no longer qualifies as “giving yourself a break", and keep trying until you find a system that works for you. I’ll let you know when (not if) I sort one out myself. You’re going to miss them when they’re gone. One of the less obvious things you miss out on when you don’t have coworkers any longer is the option to vent. More specifically, to vent with someone who understands your exact frustrations with a project. When you have coworkers, you learn each other’s personalities, develop a rapport, find a rhythm to voicing frustration, and getting it out of your system so you can get back to business. Colloquially, I believe this is known as a “bitchfest”, perhaps after a difficult client call or a blame-passing e-mail. And then your Project Manager or Account Director translates all that cathartic junk into cohesive, actionable, and ideally polite communication with the client. Well, you’re the Project Manager now. That’s on you. Learn to self-edit, know when you’re not in the right head space for a reasonable response, and practice patience at all times. Do you have any further advice related to these points? Don't hesitate to drop some knowledge in the comments below.